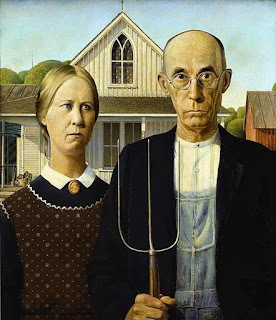 Truly one of the most iconic American artistic images is American Gothic painted by Grant Wood from 1930. The pitch fork represented hard labour while the flowers over the right shoulder of the woman symbolised domesticity. That image will soon be replaced by the image below. The iron symbolises one man's path to greatness, fame and fortune and the implement that also brought him the beating of his life. The beaten Tiger symbolizes the wrath of a woman scorned. A: Tiger Woods can drive a golf ball 400 yards.